"Who are these people trying to protect themselves from?" Freestyle Digital Media has debuted the first trailer for the indie comedy A Bad Idea Gone Wrong, a goofy film about two wanna-be thieves who trap themselves in a house they just broke into. Yeah, it's pretty much one of those why-not, let's-try-it concepts that kind of works, but also kind of doesn't. This played at a few festivals this year to quite a bit of acclaim, like winning the Best Feature prize at the dead CENTER Film Festival. The cast of A Bad Idea Gone Wrong includes Matt Jones, Will Rogers, Eleanore Pienta, Sam Eidson, and Jonny Mars. This looks a bit odd, there's something weird about the trailer that doesn't feel quite right to me. But I do think this seems like the film would be worth seeing at a festival. There's something quirky about it that's appealing enough. Leo and Marlon are trapped in their lives, working dead-end jobs, trying to find some way to make things exciting. The best idea they’ve come up with is a heist. They break into the “perfect” house, but accidentally arm the alarm system. So now they have to break out of the house they just broke into.When they discover an unexpected housesitter, they suddenly have to deal with a series of new problems: a hostage situation, double crosses, sexual tensions, and discoveries that make their difficult escape even more dubious. The three unlikely allies have to learn about one another, try to figure out who can be trusted, and find some way to work together to break out of this house. 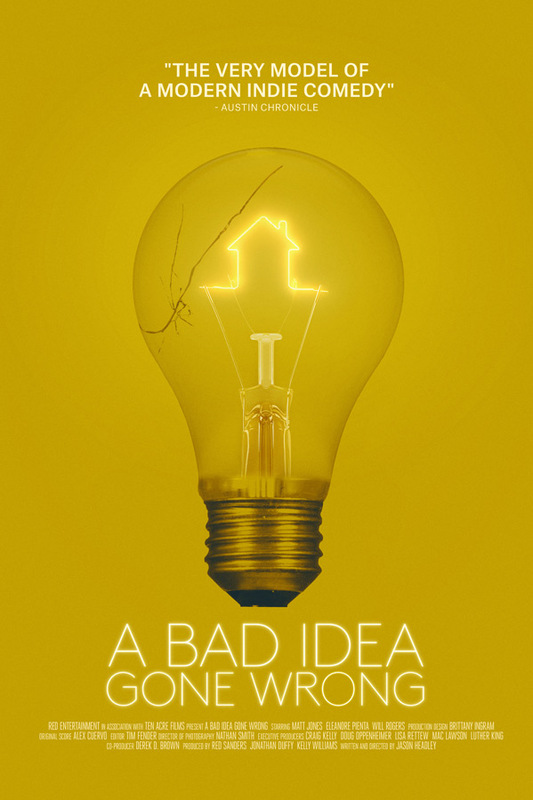 A Bad Idea Gone Wrong is both written and directed by filmmaker Jason Headley, making his feature directorial debut after a few shorts previously. This first premiered at the SXSW Film Festival, and also played at the Dallas Film Festival. Freestyle will be sending A Bad Idea Gone Wrong to select theaters + on VOD starting December 1st coming up. Anyone interested?